Doing 75 km "Ride For Heart" in Toronto this Sunday on a closed highway. Using Norco Cyclocross bike for it. I've read online different advice for beginners, but was wondering if there is anything else the community can suggest. Update: Thank you all for the advice. The ride went well and we finished in about 3.5 - 4 hours. Avg Speed was ~20 km/h. Highest recorded - 37.5 km/h :) I don't know how to pick the "approved" response because many people contributed very helpful info. With respect to riding in a group, or with more numerous riders closer to you than you are used to. Cadence - mostly down to personal preference, but the most common advice is actually to aim for 90-100rpm. I honestly wouldn't worry too much about it though. Food - don't try out something on the day that you didn't test beforehand - when working hard, this can lead to unfortunate emergency visits to the bushes! Clothing - Similar to above, don't try something untested on race day - the last thing you want is to get 50km in and find your shorts have rubbed all the skin off your thighs. Repair kit - Multi-tool, spare tube and pump/co2 as a minimum. Pacing - Don't get overexcited and chase faster riders for the first hour - this can lead to the rest of the ride being quite a miserable experience. 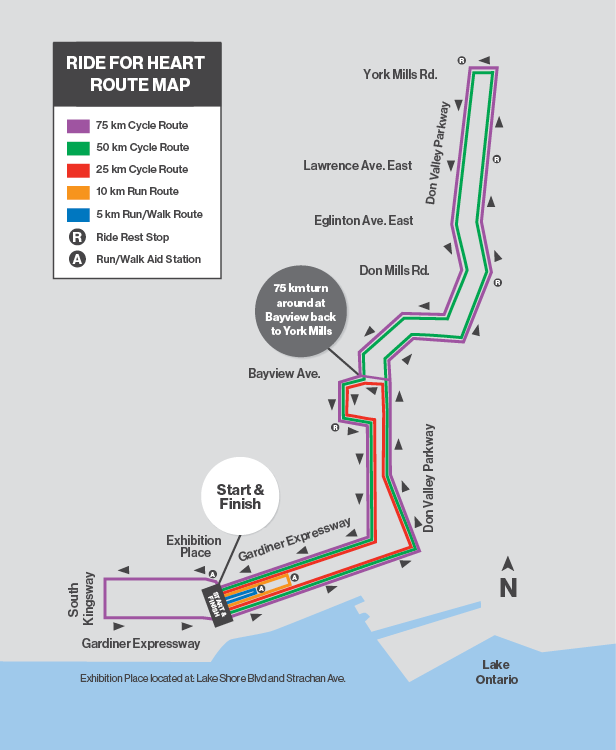 "Participants who weave, pass at high speeds or cycle at high speeds in a group/peloton are considered unsafe and will be removed from the event by Toronto Police Services." Regarding food, I don't think you should worry about that that much, have a nice dinner the night before and have a couple of "granola bars" with you for the ride. Have a nice beer after the ride (don't drink and ride/drive). I'm doing Montreal's Tour de l'Ile this Sunday (and night's tour tonight) and the above will be what I do. If you have never ridden this long, pace yourself. It is better to finish in 5 hours than to do 1/2 the ride in 2hours but be tired to finish. Break it up into three 25km rides. Ride 25 km and stop, walk a bit, eat something and rehydrate. This type of ride is a charity event not meant to be a race. Also be aware that the crowds are likely to be full of riders not accustomed to riding in large groups. Ride defensively don't assume someone won't stop in the middle of a pack with 30 riders behind them. Most of all have fun and make friends. AIR This road is probably pretty good condition, so you won't need suspension or knobbly tyres. Do inflate your tyres up toward the upper end of your normal range. Adding some more air than normal should help roll better on the smoother tarmac vs the slightly bumpier roads a CX bike would normally run over. Start Gun I note that the instructions do NOT have a start time, there is a 75km chute opens and closes time so there is no start gun, just a 30 minute window for when to begin. So it can't possibly be a race. The rest stops are marked with (R) and you're not supposed to stop anywhere else on the route. So pick one and have a breather. And good work for joining in! Not the answer you're looking for? Browse other questions tagged beginner advice new-rider or ask your own question.